Earn 44500 loyalty points when you order this item. 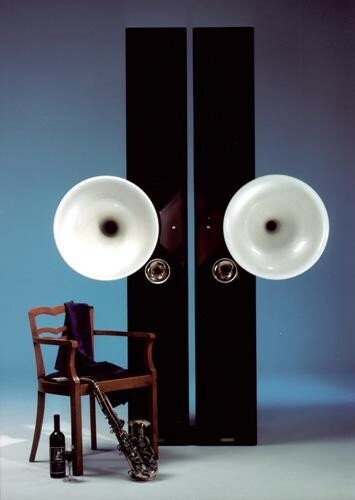 Acapella Campanile MK III speakers are sealed 3,5-way loudspeakers, featuring four 25 cm woofers are working in separate chambers so they cannot influence each other. Fine adjustments to the ion tweeter and the midrange horn unit can be made in order to adapt the loudspeaker to every acoustical environment. "Close your eyes, you won’t be able to believe that the music is coming from a HiFi system. You will get the illusion to sit in a live concert with all the musicians just in front of you. Reach out your hand and touch them! Even at lower volumes, the phenomena remains". At the time of writing, in consideration of the fact this sum of money buys you a very good Ferrari 360, Ferrari F355 or a brand new BMW M3, consider for a moment the joy such an investment in listening will give you. Like a fine car, fine music at home is one of life's real pleasures. 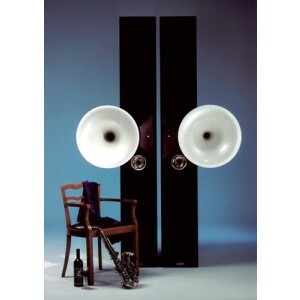 These speakers create music in such a lifelike way, you are transported to a world of listening unlike anything else you can imagine. Each pair of Acapella speakers are hand delivered anywhere in the United Kingdom by Audio Affair staff with set-up assistance if required. We can offer specific system matching and amplification advice. In addition, 0% finance is available for your convenience and we can tailor a finance package to your individual requirements. Call us and ask for Richard or Alex to discuss these speakers further and for discrete and professional service. Demonstrations can be arranged by request.